WINNIPEG - Eleven years before 15-year-old Tina Fontaine's body was pulled from the Red River wrapped in a bag, the same riverbank was the setting for another tragedy. Felicia Solomon Osborne didn't return home from school in March 2003. Frustrated by what they felt was lack of action from police in finding the 16-year-old, her family members put up their own missing posters. Three months later, one of Felicia's arms and a leg were pulled from the same spot where Tina's body would later be found. Felicia's killer has never been caught. But a lot has changed when it comes to awareness of the issue of missing and murdered aboriginal women. When Tina's body was discovered in August, Winnipeg police held an emotional news conference where a sergeant said "society should be horrified" by the violent death of a child. More than 1,000 people took to the streets to call for action. Dozens camped in the shadow of the Manitoba legislature for weeks as they repeatedly called for a national public inquiry into missing and murdered aboriginal women. Prime Minister Stephen Harper was asked about her death. That didn't happen when Felicia was killed. "Nobody connected with Felicia Solomon Osborne and yet that was some of the most savage levels perpetrated," said Nahanni Fontaine, special adviser on aboriginal women's issues for the Manitoba government. "Her mom, all she got back, was a leg and an arm. She was only 16, only a year older than Tina." 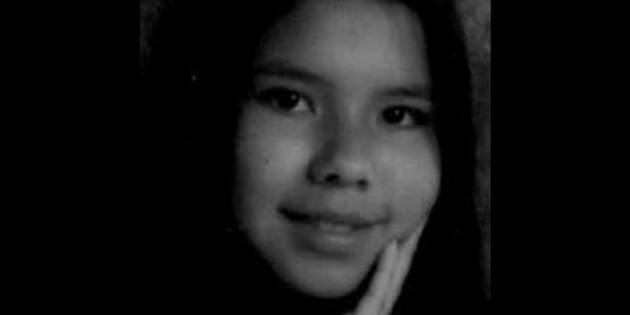 The issue reached a boiling point in 2014 with Tina's death and an attack a few months later on 16-year-old Rinelle Harper. Rinelle survived, agreed to be named publicly and has since spoken about the need to end violence against women. The RCMP issued a landmark report in 2014 which put the total of missing and murdered aboriginal women at 1,181. Although indigenous women make up 4.3 per cent of the Canadian population, the report found they account for 16 per cent of female homicides and 11.3 per cent of missing women. "Our message is getting across that this a Canadian problem," said Alberta regional chief Cameron Alexis with the Assembly of First Nations. "We have to be concerned. There is something wrong here." Bernadette Smith has been waiting a long time for such awareness. Her sister, Claudette Osborne, left behind four children when she disappeared in 2008. To this day, Smith doesn't know if her sister is alive or dead. When her nightmare first began, Smith couldn't get anyone who hadn't also lost a loved one to care. That's all changed, she said. "The conversation has switched. Other people are getting involved that aren't directly connected," Smith said. "When you find a 15-year-old's body dumped in the river like they're garbage, you start to think maybe that could have been my daughter or my sister or my niece." Smith has been calling for a national inquiry for years, but after Tina's death many more joined her. The federal government has so far refused, saying it is more interested in taking action than studying the issue. Prime Minister Stephen Harper has said Tina's death was not part of a "sociological phenomenon," but rather a crime and should be treated as such. The federal government agreed to attend a roundtable meeting after Canada's premiers emerged from their annual meeting in August calling for a national forum. It's expected to be held in February. Hopes are high the issue can sustain public attention well into next 2015. Advocates suggest the roundtable, which Harper will not be attending, is just the beginning. "I want to say something positive about it — it sounds promising — but that's about all I can say," said Manitoba Aboriginal Affairs Minister Eric Robinson. "The federal government has to be really, really serious. They have to come with an open mind and an open heart and not tell us what they've put our money towards. "I don't want to hear that. I've heard that all my life." A spokesman for Kellie Leitch, the federal minister responsible for the status of women, said the minister was busy with cabinet committees and didn't have time for an interview on the subject. Andrew McGrath sent an emailed statement on Leitch's behalf saying the government takes crimes against aboriginal women and girls "very seriously." He noted the Conservatives have earmarked $25 million over five years on ways to address crimes against aboriginal women. One project is for development of community safety plans both off and on reserves, as well as initiatives to break intergenerational cycles of violence and abuse. That isn't likely to be enough to keep the issue from resurfacing in the upcoming federal election, slated for next fall. Both the Liberals and the Opposition New Democrats have promised to call a national public inquiry if elected. Michele Audette, former president of the Native Women's Association of Canada, said she has accepted the roundtable, but the idea for a national inquiry hasn't passed. "We have so many spokespeople who will bring this issue everywhere they go," said Audette, who recently stepped down to run federally for the Liberals. "We have artists. We have musicians. We have politicians. We have all kinds of people who will work for that cause," she said. "The only (side) ... missing right now is the Harper government.